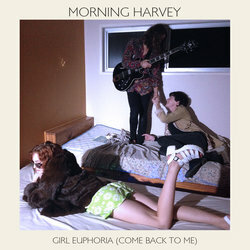 Mood Rock calibrators Morning Harvey have announced new single; ‘Girl Euphoria (Come Back to Me)’ and an east coast tour this April, presented by Who the Hell. Following on from the bands 2012 debut EP ‘Well for Wishes’; that introduced the band to Australian and International audiences, this stand alone single marks a natural progression in the Brisbane Five-Piece’s sound. Still laden in 90’s references and a restrained exuberance, ‘Girl Euphoria (Come Back To Me)’ marks a new direction, characterized by a break beat percussive rhythm, a driving baseline and leading guitars - surrounded by plenty of feedback. Here is a band that is equal parts ominous and engaging. ‘Girl Euphoria (Come Back to Me)’ was produced by the band and mixed by Magoo at Applewood studios. Morning Harvey will take their mesmerizing and euphoric live show on the road this April on a headline tour, including a free hometown show.